The Drosophila mushroom body, shown in the MB010B-GAL4 line. Courtesy of Katrin Vogt. At his plenary lecture at the FENS (Federation of European Neuroscience Societies) Forum of Neuroscience last month, Larry Abbott talked about two distinct but very similar systems in which randomness may play a critical role in shaping the circuit and allowing for its complexity. 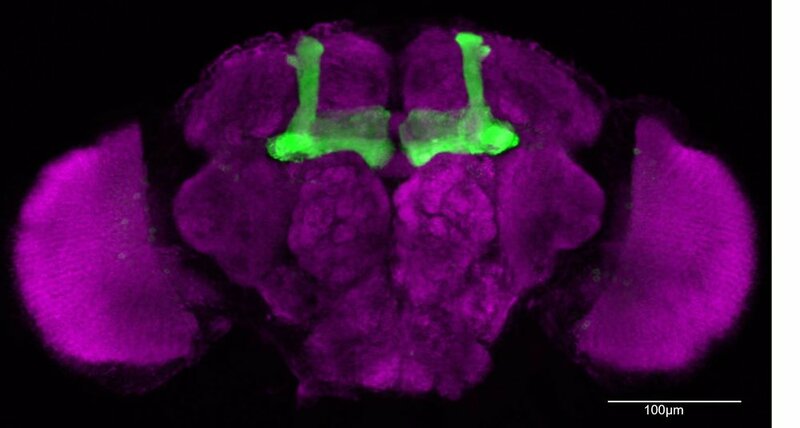 The work he presented focused on detangling the role of the Kenyon cells in the olfactory learning center of the Drosophila brain, called the mushroom body. He compared these cells to the granule cells of the mammalian cerebellum - a fair comparison because unlike most other known neuronal cell types, both these cell types receive a surprisingly low number of inputs: an average of 4 for granule cells, and up to 6 for Kenyon cells. The two systems, that granule cells and Kenyon cells are part of, are very similar in their organization. They both comprise three layers: a first input layer that is highly organized and contains a limited number of sensory cells (the olfactory glomeruli in Drosophila, and mossy fibers in the cerebellum), an output layer that is equally organized and is linked to behavioral commands (the mushroom body output neurons in Drosophila, and the Purkinje cells in the cerebellum), and finally a middle layer with a high number of cells that at first glance appear randomly wired (the Kenyon cells in Drosophila, and the granule cells in cerebellum). In a brain where the vast majority of cells are joined at various locations by thousands of synapses of varying strengths, finding a population of cells that only has a handful of synaptic inputs should be a relief for the computational neuroscientist trying to model its behavior. As it turns out, these cells provided quite the head-scratcher. Abbott compared the organization of these neural circuits to the workings of machine learning algorithms, where the input and output are understood and structured, but the connecting layers are complex and hidden. Abbott, in collaboration with Rubin and Axel, has attempted to decipher this middle layer of Kenyon cells, and understand the network of their inputs and their role in the process of odor learning. In a 2012 paper they used careful tracing and functional mapping of the olfactory glomeruli to the dendrites of Kenyon cells to reveal a random set of connections (Caron et al., 2012). Random connections means that the mapping of projection neurons onto Kenyon cells is no more organized than shuffled combinations. It also means that knowing the input onto one Kenyon cell dendrite gives no predictive power as to which other cells also synapse onto it (Aso et al., 2014). Interestingly, Abbott suggests that the randomness of the antennal lobe to Kenyon cell connectivity patterns might be the key to the mushroom body’s ability to match sensory inputs to meaning and a variety of behavioral outputs. This matching occurs at the axonal projection targets of the Kenyon cells: the mushroom body’s output neurons. This synaptic layer is highly plastic, and combines inputs from dopaminergic neurons as well. How does the wiring of Kenyon cells allow for olfactory learning? Abbott suggests that the key is increasing dimensionality. The olfactory glomeruli represent odors in a 50-dimensional space. The Kenyon cells, as a large population of cells that each mix inputs from a small number of olfactory glomeruli, amplify odor representation by at least one order of magnitude (Aso et al., 2014). This more complex and varied representation allows for an easier categorization of odors at the level of behavioral output. Reexamining the connectivity in this light, Abbott and his colleagues found that the Kenyon cell innervation appeared more diverse than a random connectivity: the number of cells with the same combinations of inputs was below chance. Especially when considering that the number of synaptic inputs ranges from 1 to 6, a truly random system would have a higher probability of duplicated input combinations. Abbott and colleagues suggested that the system actually favored diversity over randomness! Is randomness then a too simple model to understand the dendritic innervations of Kenyon cells? In many ways, elementary biological processes are all random: molecules bumping into one another, and neurons finding synaptic partners. Peters and Feldman had suggested in 1976 that axons randomly innervated the dendritic targets in the area. The findings from Abbott’s lab, and much other work in recent years, suggest that further rules restrict or diversify synaptic connection patterns, taking random processes and optimizing their functional potential. Caron S.J.C., Ruta V., Abbott L.F., Axel R. (2012) Random convergence of olfactory inputs in the Drosophila mushroom body, Nature, 497, p. 113-117. Aso Y., Hattori D., Yu Y., Johnston R.M., Iyer N.A., Ngo T.T., Dionne H., Abbott L.F., Axel R., Tanimoto H., Rubin G.M. (2014) The neuronal architecture of the mushroom body provides a logic for associative learning, eLife, 3e04577. Davis M. (2001) Mathematics of Financial Markets in Mathematics Unlimited: 2001 and beyond (ed. Engquist and Schmid). Peters A. and Feldman M.L. (1976) The projection of the lateral geniculate nucleus to area 17 of the rat cerebral cortex. I. General description, J Neurocytol, 5(1), p. 63-84.